Continued high demand for illegal wildlife products has greatly endangered many species like elephants, rhinos, and tigers, leaving some facing imminent extinction. The world is experiencing the worst poaching crisis in history, rivaling that in the 1980s, when more than 800 tons of ivory left Africa every year and the continent’s elephant populations plunged from 1.3 million to 600,000. Scientists estimate that only 430,000 African elephants remain today with one elephant killed every 15 minutes for its ivory. Poaching is at its highest level in decades. Unless the illegal and inhumane slaughter of elephants, rhinos and other species is halted, we will likely see these magnificent animals disappear from the wild in the next several decades. As one of the world’s most lucrative criminal activities, valued at US$19 billion annually, illegal wildlife trade ranks fifth globally in terms of value, behind the trafficking in drugs, people, oil and counterfeiting. Research shows that domestic ivory markets provides cover for criminals to launder illegal ivory from poached animals, puts the burden of proof on enforcement officers, and confuse consumers, many of whom take market availability of ivory for legality of the trade. The rapid development of online media has put a lot of wildlife species at risk and has created huge losses for the global ecosystem and human beings, as criminals have used the Internet for secret, fast and convenient communications and transactions. The report Wanted: Dead or Alive, Exposing the Online Wildlife Trade reveals that over 33,000 endangered wildlife and wildlife parts were available for sale online in a short six-week period. 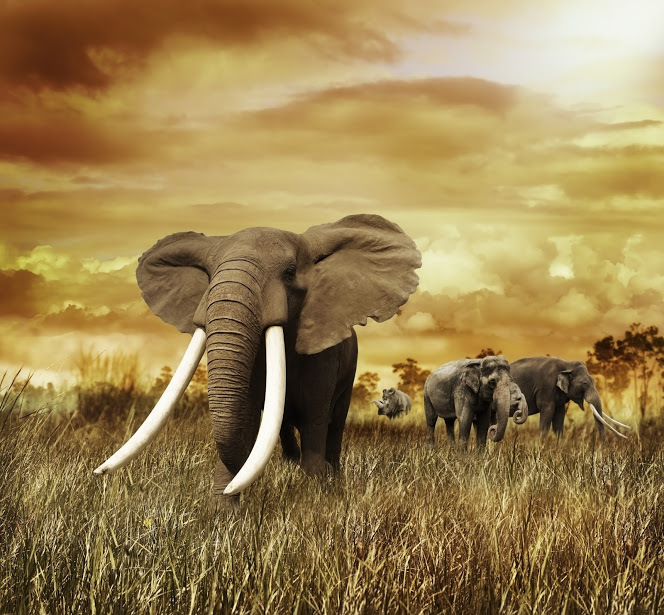 Ivory trade is quickly pushing endangered animals towards extinction. Every year, 25,000-30,000 African Elephants are poached to supply the ivory trade. According to the Elephant Trade Information System (ETIS), in recent years the volume from large-scale ivory seizures has been setting new records. In 2013, enforcement agencies around the world seized 41.6 tons of ivory, representing a 71 percent increase from 2009. Research shows that for slow-growing, long-living species like the elephant, when mortality rate reaches 6% the population risks crashing. However in many regions of Africa, elephant populations are declining at a rate of 11%-12% because of ivory trade. The past 15 years has seen soaring market prices for ivory products, largely due to a growing middle class in China and other Asian countries where ivory products have significant cultural value. Most people don't know that the U.S. is also one of the top consumers of ivory. Enforcement operations are a deterrent to wildlife criminals in and outside of China. To combat global illegal ivory trade, countries are publicly destroying seized ivory. Kenya, Ethiopia, United Arab Emirates, the Republic of Congo and the United States have torched ivory. Public destruction of confiscated ivory, together with vigorous enforcement, raises the cost for engaging in wildlife crime and warns the public about the criminal nature of ivory trade. Such measures help stigmatize ivory consumption and reduce demand. The U.S. federal government is working to close the loopholes that have allowed the illegal ivory market to flourish. A number of states have also passed ivory bans, including New York, New Jersey and California. Campaigns to reduce demand for ivory domestically and overseas, and to strengthen international laws and enforcement, have further elevated the issue of wildlife trafficking globally. Collaboration between conservation organizations, government agencies, private organizations and local communities supports on-the-ground initiatives to conserve and manage wildlife through improved anti-poaching patrols, monitoring, habitat management, community-based initiatives and other effective conservation programs. From African range states, to smuggling transit routes, to consuming countries, actions must be taken on every link of the transnational ivory trade to stop the crisis. Combating illegal ivory trade requires the effort of the whole world.